Who would have thought an update on a road construction project would make good material for an inaugural blog post? It doesn't sound too compelling does it? However, in our section of the Tucson area, known as the Tortolita Foothills, the recent paving of Moore Road was BIG news. Along with our neighbors, we had been collectively discussing it for years every time we got together. Years ago the majority of Moore Road was paved all the way from the neighboring community of Oro Valley up to about a mile from the turn to Casa Campana. Why it was never completed seemed to be a mystery even to long-time locals. Promises on paving the last mile were made in conjunction with local development projects over the years. Unfortunately, the economy imploded, years went by, rumors were passed back and forth, while other roads were paved and even re-paved... But nothing ever seemed to happen with the last sad section of Moore Road. This section was essentially a dusty washboard stretch that required regular citizen calls to the town manager to reapply gravel after every major storm. The road probably could have been paved several times over with what was spent on gravel over the years. In spite of the conditions, our first year guests at Casa Campana were troopers and never complained. It seemed like our little oasis at the end of the journey made the trip down the bumpy gravel pathway worthwhile. When trucks started dumping piles of sand and gravel in the area last fall, we all assumed it was being stockpiled for a different road project nearby. Given our collective skepticism, we were all thrilled when fliers appeared on front doors one morning announcing our section of Moore Road was finally being paved as part of a four month improvement project. That seemed like a long time just to pave a one mile section of road, especially given it had already been compacted by years of use over layers and layers of gravel. But, hey, it was finally going to happen! After four months, plus a one month extension, we received a text message one morning from our guest at the time saying that the newly paved road was finally open!!!! I think they were as excited about it as we were. The first thing I did was call our neighbor, Robert, who without even saying hello, just answered in a hushed, reverent voice… “It’s a beautiful thing!” Of course he meant the road. And we couldn’t agree more. 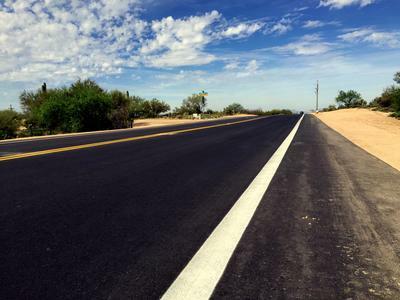 Shortly after the paving was completed near us, the crew continued paving westward toward the Dove Mountain Resort community and connected a brand new segment of Moore Road all the way into Dove Mountain Boulevard. This is a beautiful drive and is an added bonus because it cuts the travel time from Casa Campana to the Gallery, Heritage, and Dove Mountain golf clubs, Tortolita hiking trails, and to the restaurants at the Ritz Carlton Resort in half to less than ten minutes. We love the new road and it is indeed... “A Beautiful Thing”.